The Sound of Music opened on Broadway in 1959, starring Mary Martin as a nun-in-training who falls in love with a widower after taking a job as his children’s governess. The musical won five Tony Awards. Then in 1965, when Julie Andrews took over the role of Maria for the lavish 172-minute film adaptation, the film earned five Oscars. That film is one of our family’s favorites, so a remake seems almost sacrilegious. Why even attempt it? 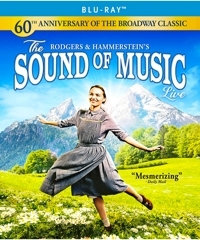 Though I was surprised to learn that there’ve been nearly a dozen film and television versions of The Sound of Music, all I knew about was the Rodgers and Hammerstein classic and The Sound of Music Live, a 2013 mistake featuring singer Carrie Underwood. So it’s probably an understatement to say that my wife and I began watching this 2015 live British television production expecting to be disappointed—especially since we’ve seen our share of lackluster filmed stage performances. While you may get a better view than if you were sitting in Row 20, it’s still a filmed version of a live performance with cameras positioned unobtrusively off-stage, creating an odd distance and dislocation. There may be three or four cameras to give you different angles, but gone is the excitement of sitting in Row 20. As it turns out, we liked The Sound of Music Live nearly as much as the 1965 movie, partly because it’s a quality production and partly because of the very nature of the production. As one of the actors says, it’s a script-to-stage theatrical production that’s filmed on three soundstages for television, but shot in cinematic style using 17 different cameras. It feels like a movie, but it also has the look of a live performance. Instead of the bright three-point lighting that’s a film-industry standard, what’s here comes closer to stage lighting. In this version, cameras are everywhere and they follow the actors with medium shots and close-ups, but because characters go behind pillars and such and we see angles that would be denied a theatrical audience, it feels as if we’re right there on the set with the characters. It’s a strangely exhilarating feeling. It’s human nature to compare, especially when the 1965 film seems so incomparable. But if we’re honest, that original film isn’t perfect. 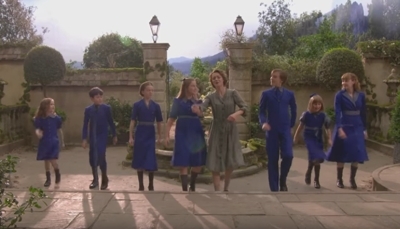 Most of the good music happens in the first half, and the second half seems to drag a bit with the narrative of the von Trapp family’s attempt to leave Austria as the Nazis have come to power. This version of The Sound of Music Live doesn’t drag anywhere. At 119 minutes it’s an hour shorter than the 1965 film, and yet the story remains basically the same. We found it interesting that the original film version cut out two Broadway songs sung by Capt. 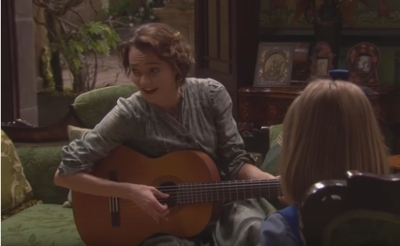 von Trapp’s “intended,” the Baroness Schraeder, and the Captain’s friend, Max Detweiler, who is looking to discover new acts for an upcoming music festival. Are those two songs as good as the others? No, but they feel right at home in this filmed stage production, because the limitations of three sets forces a certain amount of creativity and compression. Crisply paced, it’s enjoyable from start to finish—though a few charming scenes from the original movie aren’t included. “The Lonely Goatherd” song is what Maria and the children sing that first stormy night when they visit her in her room, and I have to admit that I missed the puppet show that was added for the 1965 film. Also missing in this version is the nun’s mischievous disabling of the Nazis’ vehicles that helps the von Trapps escape. But there’s a vitality that this version has that probably comes from doing it live. As for the performances, no one can capture the subtle romantic sizzle of Capt. von Trapp like Plummer, and there’s no match for Andrews’ starry-eyed innocence. But Tointon makes Maria her own, and she’s every bit as likable and believably earnest. She also has a wonderful voice, though her style is less operatic than Andrews’. 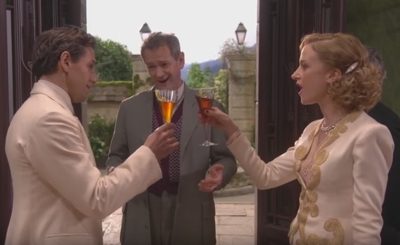 Meanwhile, Julian Ovenden doesn’t quite capture the pivot from employer to romantic interest the way that Plummer did, because he lacks that look of smoldering interest. But in every other aspect he’s just as good—better, if you count his singing. And the children? Collectively they’re an engaging bunch—and just as engaging on a behind-the-scenes feature that will appeal to all those budding actors in your families. The bottom line is that you have to be as fanatically devoted to the 1965 film as people are to their sports teams and political parties not to appreciate this live performance. Directors Coky Giedroyc and Richard Valentine are confident enough to embrace the differences between this version and the film you know everyone will be comparing it to. And that’s saying something. This is G-rated family entertainment that will seem even more entertaining to young viewers because of the crisp pacing and shorter runtime. And Shout! Factory did a nice job with the Blu-ray transfer and bonus materials.